Among the regions of the bayou, from the swamp to the riverlands, this plantation area was especially fun in establishing it as part of the bayou yet distinguished enough to distance it from the more jungle-y areas surrounding it. The coastal area was especially fun. In an old version of our fiction, there was supposed to be a storm but regardless I tried to capture what I remembered of beaches on the inner Gulf Coast, trash and litter and so much seaweed washed up upon the shores. In the most dense parts of the Bayou Fantom, there was a nice serene beauty that our team captured, from the ambient sounds of the water and wind in the trees, to the light piercing gently through the veil of trees. After establishing so many waterfront homesteads and villages, I wanted to try sunken and dilapidated areas, to give some character and establishing Points of Interest for players as they chugged by in their boats. We wanted this place to feel like the famous Oak Plantation in New Orleans, but to give it a worn down, forgotten feel as well. Tree and guide line maintenance was key here as the player would visit often for their capo meetings. This user's video nicely shows off a small part of the road network I was responsible for building and maintaining. Navigational data and a smooth driving experience were critical for gameplay--while props and set dressing, vegetation placement and painting were essential for selling the environment. To self-review work I would often drive or fly through the world at player-view to ensure my level felt good to traverse. This user's video happily captures the good driving experience in and around my district. I was responsible for maintaining road networks and traversal throughout my district as well as connections into neighboring levels. A large part of my focus was spent on guiding the player around the world, using vegetation and tree placement to give them warning of snaking roads ahead, claustrophobic and moody areas, as well as opening up the spaces to encourage exploration and hopefully invite players into areas. Because of the unique nature of my district, an additional challenge to embrace were the miles and miles of shoreline. 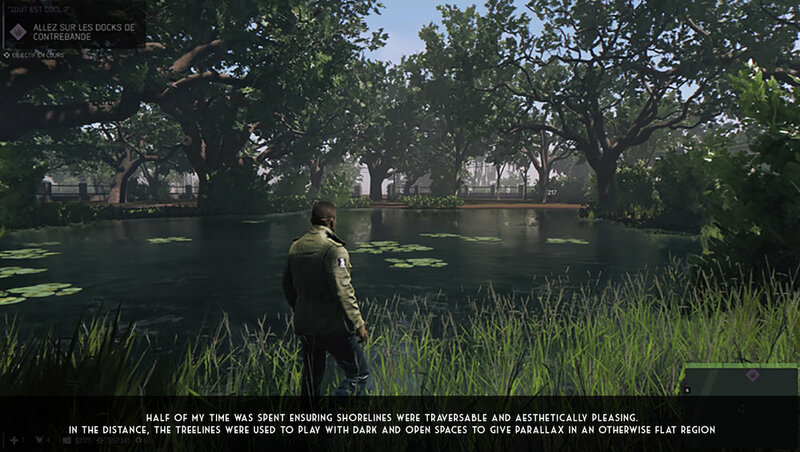 I was responsible for ensuring player traversal throughout the Bayou's waterways, (seen at the 2 minute mark) from boats to swimming paths, to shorelines and docks they could climb onto by upholding our strict metrics. For my part I wanted to sell the environment that reminded me of the bayous back home and further east in Louisiana so that players would have a more authentic and enjoyable experience. This user's video nicely shows off the different regions of the bayou, of which there were four. We seem to start at the coastal, ocean facing southern region and head back into the higher forested areas. The other two sub-regions were the plantation and swamp themed spaces. This was a hilarious video that I really enjoyed back when we launched Mafia III. 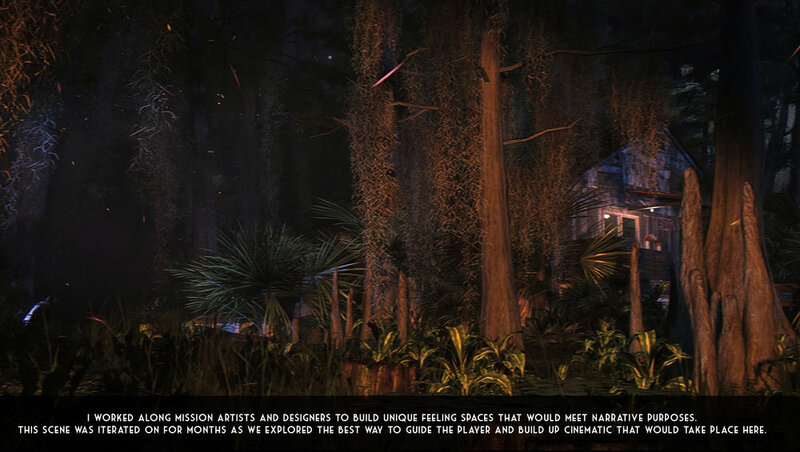 It shows off a lot of my work throughout the bayou and is quite heart warming that they shared the same glee our dev team did in playing with the gator system.